David and Katharine Lowrie have a mission: running 5,000 miles in one year, from the southern tip of Chile to northern Colombia, to benefit the continent’s wildlife and wild places. The intrepid Lawries will finish running the Carretera Austral, Aysén’s wild route through the wonderful wilderness of Chilean Patagonia, this week. Katharine and David are both 34 and from Britain. They began running on July 28, the opening day of the London Olympics, from the southern tip of Chile and have now covered well over 1,000 miles. They ran through the Patagonian winter, braving rain and storm, pulling a trailer loaded with the gear necessary to survive such weather and the great distances between villages and towns. “They spent one night at our home when they passed through La Junta, during which time we came to understand why they have undertaken such a mission,” says Earthwalker Paul Coleman, accompanied by his wife, Konomi. “In a nutshell, they love the earth. They love nature, wildlife and the seas. David is an avid sailor, and soon after their marriage Katharine joined him on his old wooden sailboat. Off they set into the wild blue yonder, sailing from the UK through the Panama Canal, around the Pacific, Easter Island, the bays and fjords of Patagonia and finally around Cape Horn to Uruguay, where they left the boat to embark upon their current journey.” Mr Coleman continued. “As professional ecologists with a keen interest in birds, they have written numerous articles and a book while educating children on the sea birds they encountered along the way. “Not surprisingly, they also experienced the negative aspects of life in the modern age. Entire islands of garbage floating in the sea, declining numbers of fish (which they have given up eating), and forests being bulldozed in the name of development is destroying the very ecosystems that are needed for those developers to survive. South America is blessed with some of the world’s most incredibly beautiful life-giving regions says Paul Coleman. Places like Patagonia and the Amazon immediately come to mind. But many of these places are coming under attack. You would have to be a Martian with a broken radio to not know what’s happening to the Amazon. For a thousand reasons including gold mining, dam building, road construction, oil exploration and exploitation, deforestation for cattle or soy production, the forests are being destroyed in the blink of an eye. These things we know. What most of us don’t know is how we can protect them. What can we do? “Katharine and David have realized that we are the masters of the ship,” added Mr Coleman. “If they can run across an entire continent, five thousands miles in a single year, is there anything we can’t do? As a reminder of their visit to the Coleman’s Katharine and David planted trees in the picnic garden, so all those who visit that garden in the years to come can continue to share that mission. 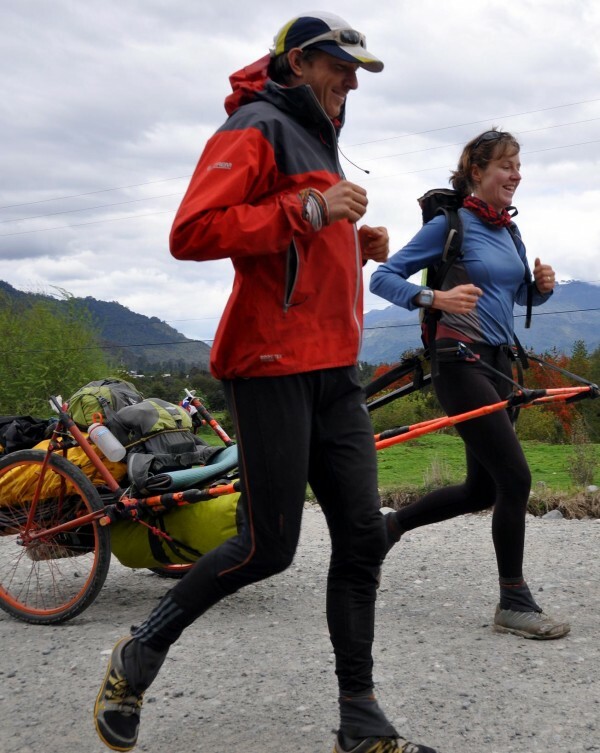 Katharine and David’s run through Chile will soon be coming to an end as they cross over into Argentina, before making their way up to Bolivia, Brazil, Venezuela, and Colombia.